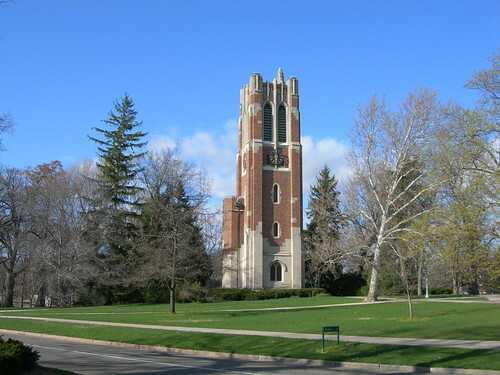 This summer, as for the past 14 summers, the MSU College of Music is putting on it’s annual Muelder Carillon Series at the MSU Beaumont Tower. Performances take place Wednesday evenings 6 – 7 p.m., now through August 3, 2011. If you happen to be staying at our Lansing Bed and Breakfast midweek this summer, we hope you’ll check it out. Stretch out with a picnic on the lawns by Beaumont Tower during the Muelder Summer Carillon Concerts. All are invited to bring lawn chairs or blankets and picnic baskets. Perhaps you want to enjoy a glass of wine while with your music before returning to our Lansing fine dining restaurant for dinner. The setting is lovely and the atmosphere relaxed. More information is available at Muelder Summer Carillon Series.